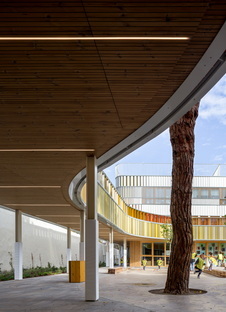 b720 Fermín Vázquez Arquitectos designed the new Lycée Français Maternelle in the Bonanova district north of Barcelona. 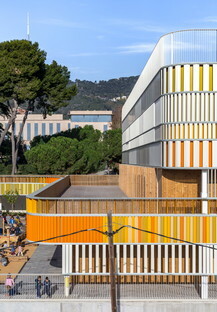 The lot on which two historic early twentieth-century villas once stood now hosts a new building with multi-coloured walls of timber and metal. 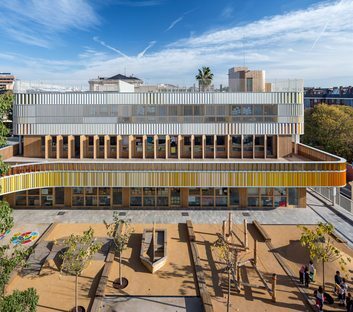 Fermín Vázquezì’s studio B720 was appointed directly by L’Agence pour l’enseignement français à l’étranger (AEFE), run by the French Education Ministry, to renovate one of the two campuses of the Lycée Français de Barcelone, the one housing the nursery school in the Bonanova district northwest of the city centre. In the early twentieth-century, the Bonanova district was home to well-off members of the local bourgeoisie. Social change and migration resulted in gradual abandonment of many prestigious buildings in the area, now used to house offices and schools. 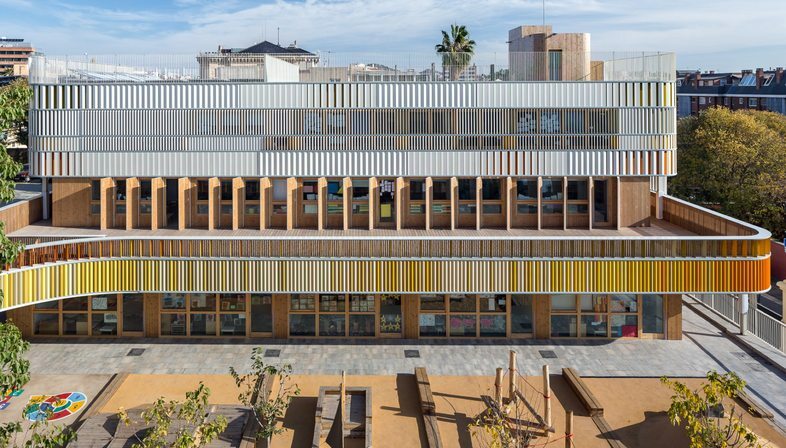 These include the twin villas at Carrer de Munner 3 which contained the growing French school, resulting in a series of temporary installations and additions. Fermín Vázquez found himself working on a lot measuring about 3000 square metres, raised above street level and surrounded by public institutions (educational buildings, a hospital complex, etc.). On the site, positioned symmetrically in relation to the cross-wise axis of the lot, stood two villas constructed in a historical style on two levels, with a flat roof surrounded by a richly decorated balustrade, with stringcourses and a monumental façade. 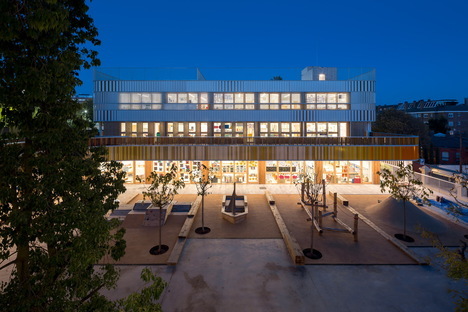 Previous renovations had resulted in the construction of a low building with a temporary look at the back of the lot, to the north, connecting the two villas for use as a school. All around this was a big schoolyard or garden which had been used for educational purposes but had no street furnishings or equipment. The signs of time on the walls of the historic buildings and the accumulation of temporary elements at the back of the lot led to the decision to renovate the prestigious school campus. The Lycée Français de Barcelone, founded in 1924, was in fact one of only a handful of institutions providing a free, critical, open education during the Spanish civil war. 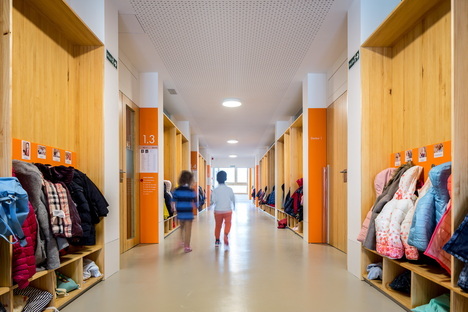 The wealthy Catalonian bourgeoisie of Barcelona began to send their children to school there, and this tradition has continued, even though it is said to be increasingly hard to get into the school because of the long waiting list. It was partly because of this that the school needed a larger building, in better order and with a more impressive presence. 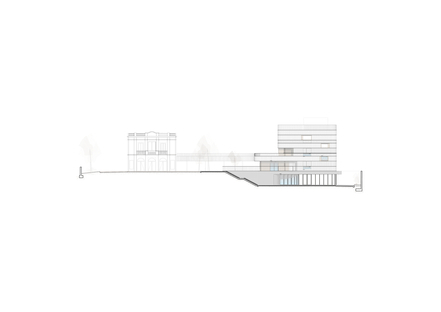 It was decided that one of the two villas, the one to the east, would be replaced with a new building, on the same scale and with the same proportions as the historic villa. 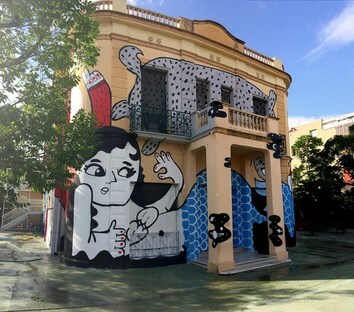 Just before the project began, in the summer of 2016, the school held a workshop for children in which street artist and illustrator Amaia Arrazola painted a mural on the wall of the villa that was to be demolished, an ephemeral work of art intended to celebrate the old set-up of the school while awaiting the construction of the new one. 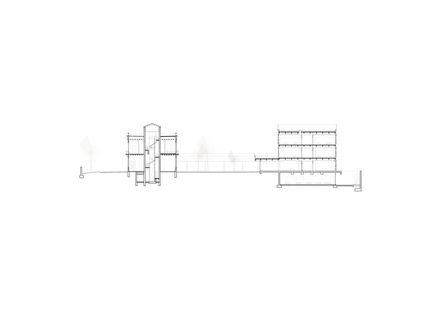 In view of the need for a link between the two volumes, as expressed by the architectural stratification created over the years, the architects designed an arcade on slender columns completely surrounding the central playground on the northern side. 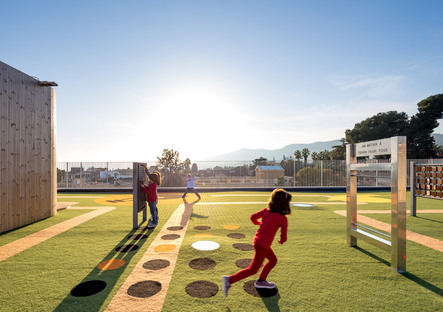 Here, the pavement and the set-up of the playgrounds with wooden playground equipment did not get in the way of preservation of the trees already present on the site. The walkway is in actual fact a continuation of the patio on the second level of the new building, which, like its walls, is covered with two orders of colourful metal strips, on both the floor and railings. 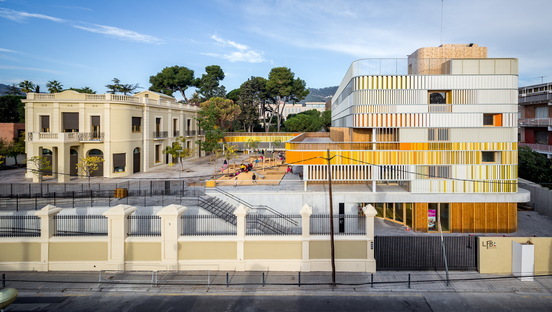 This is the most surprising aspect of Fermín Vázquez’s project: alluding to the volume with rounded corners of the historic villa, the project adds a second one, only a little bigger, and covers it with a skin of steel slats in a colour palette inspired by the light yellow of the restored plasterwork. In this way the lines of the stringcourse are restored in the horizontal rhythm of this colourful skin, and the vertical strips of different sizes run at different rhythms along the walls, embracing the entire volume and creating the sensation of a kinetic façade. 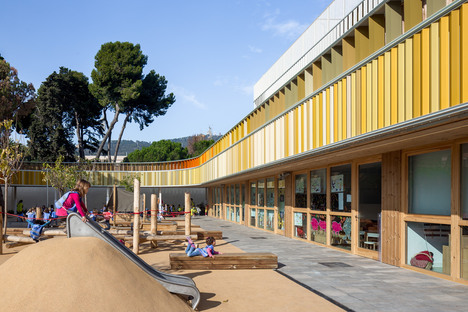 Their position, orientation and rhythm are designed to provide adequate shelter from the sun, while other parts of the building’s cladding are made out of heat-treated natural timber, which is an insulating material resistant to wear. 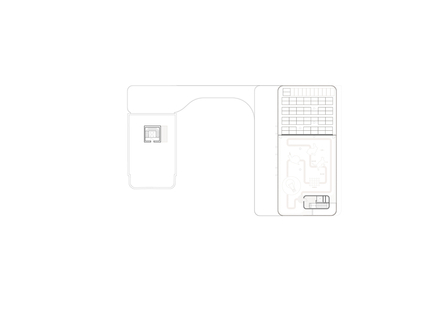 The layout of the new volume is divided into four levels, plus the rooftop playground. 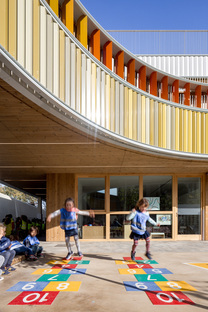 The new entry to the school is on the basement level in the new building, from which children can climb an outdoor staircase or ramp to the playground and garden. 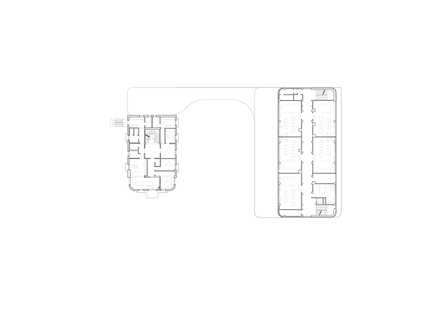 The classrooms are all located on the first three floors above ground, divided according to age on different floors. The common areas, such as the multimedia library, the music room and the administrative offices, are located in the restored old villa.